Adding lighting to a pond creates another dimension to a garden’s ambiance at night. Even though lighting doesn’t provide any real benefits to the fishes, they allow you to see what they are up to when the sun goes down. There are a number of areas where lights can be placed to decorate and light up a pond. Here we will go over the three general areas, specific garden pond lighting ideas and also the different types of lights. The pond lighting ideas outlined below can come in two different bulb types, Halogen and LED. The most common pond lights are low voltage 12 volt halogen lamps. These are inexpensive lights that only come as white bulbs (colored lenses are included with some pond lighting kits). Halogen light bulbs do give off a lot of heat, and consume a lot of energy, making them have a short life span. LED pond lighting is an alternative, which is becoming more and more popular. These are eco friendly lights that have a much longer life span than halogen bulbs. Because they use much less energy, they give off less heat which is ideal for lighting small ponds. Unlike halogens, the LED light bulbs themselves can come in a range of colors. There are also LED pond lights that are preprogrammed to fade to different colors. When it comes to deciding which lighting ideas are best for your pond, you will want to decide if you want to create soft and subtle lighting or turn your pond into a garden feature by adding more light fixtures. Do you want to see the whole pond at night or just light certain areas and see glimpses of fish as they swim by – creating a more mysterious and enchanting pond at night. Underwater lights are the most common lights in creating a well lit pond at night. These are low voltage electrical lights. Usually 35 to 75 watts, the deeper the pond the higher the wattage needed. The most popular types are kits that contain 1 or 3 lamps that you stake to the bottom of the pond. Another option is to have recessed lights fitted into the bedrock underwater (much like swimming pool lighting). There are also lights that are fitted into a rock shaped encasing, that blends in with the rest of the pond. These are low voltage lights that are submerged underwater. Most underwater lights are used for general lighting – they wash a general area of the pond with light. However, there are spotlights that can be used underwater. These are used to provide more focused and localized lighting, highlighting a certain spot underwater, whether that is a rock bed, an underwater statue, etc. Lighting Tip: More natural hues of colors (off white, orange, green, yellow) are used for submersible pond lighting, while purples and blues are generally used for decorative above water lighting. Another way of adding lighting to a pond is to add lights that sit above the water. Floating pond lights are an elegant lighting fixture to add. These can come as low voltage or solar powered versions. Floating solar lights are a lot easier and cheaper to install, and will automatically come on as it gets dark. These lights generally have the bulb above the water and will wash the surface of the pond with light. There are floating lights that have the bulb on the bottom so the light points down into the pond. This acts as moon lighting, lighting the pond and the fishes from above. Using floating lights along with underwater lights will create soft and subtle lighting for a pond. Another above pond lighting idea is fountain lighting. If you have, or are planning on installing a fountain that aerates the water, spurting water up into the air, lights can be installed at the base. The lights are pointed up onto the shooting water, illuminating and even changing the color of the water (with the use of lenses or colored LED lights). This creates a colorful water display. Lighting the perimeter of the pond adds to the visual display of the pond and also to the safety. Outlining the perimeter of the pond helps in navigating around it at night. There are a number of perimeter lighting ideas. Simple perimeter lighting ideas would include solar lights. These can come in rock shapes to blend in with the landscape, or solar stake lights that are planted into the soil around the pond. Recessed lights can be installed into the ground and rock bed above the water (either as solar powered or low voltage). Spotlights shining from above are ideal for larger ponds. These can be attached to a wall or the rock bed, and can shine down onto a particular area or feature in or around the pond. 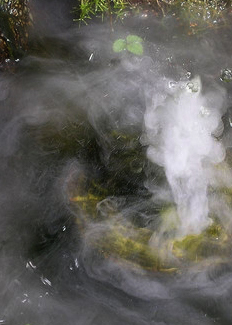 A small waterfall, where the water simply cascades down over a small rock bed and ventilates the pond, can be lit up with simple above ground or even underwater spotlights – turning the waterfall into a feature of the pond. How about adding a simple pond mister? These are simple devices that create a mystical mist above the water. They are completely safe to life in the pond. These are used only for decorative purposes, and with the use of lighting they create a beautiful water display. Here you can use LED lights that can change the color of the mist. Good quality pond lights range in price from $20 for simple floating lights and single submersible lighting kits to over $200 for complete lighting systems for garden ponds. When it comes to pond lighting ideas, simple and subtle lighting goes a long way in creating a beautiful water feature. Invest in high quality fixtures as these will be able to stand the conditions of pond life.